Arete Associates is an engineering consultant that is located in an office building in Northridge, California. They are a long-time customer of ours and we have assisted them with many different interior and exterior signs. Office buildings require a lot of signage, namely wayfinding and identification signs. 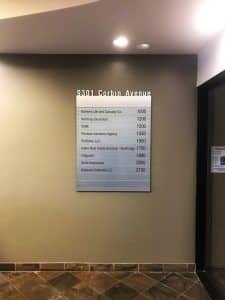 In the lobby of the building, there is a directory sign that lists all of the tenants and their respective suite numbers. As tenants move, change suites, or change names, this information needs to be updated frequently so whenever there is an update, Arete Associates reaches out to us to create new vinyl lettering to replace the old information. As suites can be combined or split up, they were starting to run out of space on their existing directory sign. 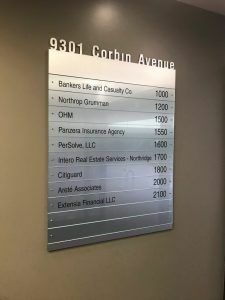 This directory sign was already there when we began working with Arete Associates, but we have become familiar with it over the years of replacing the strips. The existing sign had eight spaces, and they decided to add three more. We did a full site survey on the sign to recreate an identical sign for them but made it taller to have enough space to add 3 more tenant strips. 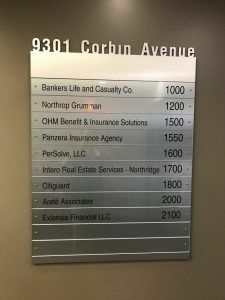 Office buildings are constantly making changes to signage which is why it’s nice to find a sign company that you can depend on that understands your needs and can get your signage updated efficiently. As directory signs and tenant identification signs are made in a way that the information can be changed easily, we are able to handle signage update for them easily because we already have the exact dimensions they need and know the style of the other signs in the building to make sure that they are all uniform. Are you looking for an easy way to show all of the tenants in your office building and where they are located? Give us a call today to get started on your custom directory sign.